I think we've all gone past the era of using eyelash extensions or falsies (false eyelashes) when it comes to opening up our peepers, mostly because of how TROUBLESOME they are or how fake it can look. At least, that's how I feel. That's why I was super excited when Beauty Recipe Aesthetics approached me once again (we were previously in touch to review their 6D Nano Eyebrow Embroidery) to try their latest Keratin Lash Lift treatment at promotional price of S$79 (plus get 1-for-1 promo at bit.ly/alexislashlift) with Semi-Permanent Mascara S$39 add on. Those who know me and met me in person must know that i have pathetic short, sparse and straight lashes. Hey alliteration! The goal is to transform them into long, luscious ones. See my before and after lash lift for comparison. And this was before the semi-permanent mascara. The new branch of Beauty Recipe Aesthetics is situated at B2 of Orchard Gateway, which is super convenient and central compared to their Marine Parade branch (for brows) and original branch in the West. According to Jessie, lady boss and my lash expert, they import all the lash products from Australia. She also explained that they are the first aesthetic company doing this procedure of lash lift in Singapore. Elleebana is the brand of the lash products used, including the mascara. I was relieved to hear that because I would prefer European or Australian products instead of China or Korea/Taiwan for these! As you can see, silicon rods (those orange rubbery things) are placed at the base of my lashes. 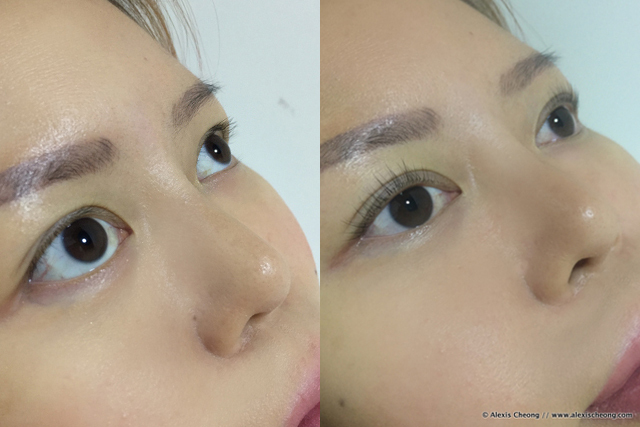 The Keratin Lash Lift is different from eyelash perming, which a lot of people do. I have never done that before because the perming solution smells awful and all your lashes are subjected to the harsh chemicals. The Keratin Lash Lift only applies serum to the base of your lashes and they are coated with keratin after. Here's another before shot. Look at how non-existent my lashes are! However, my eyebrows are super on point, thanks to a recent touch up of my 6D Nano Eyebrow at Marine Parade, haha. Finally, after the treatment which took about an hour+ (I had some mild stinging sensation in my eye from the serums used, Jessie had to drop eye drops for me), I was done. I think the stinging in eyes was the only slight discomfort you might experience, which you can just highlight so the beautician can drop eyedrops and make sure you're comfortable before continuing. This was the result BEFORE the semi-permanent mascara was applied. I have natural lashes??? And here's the after of everything! Wow. My eyes look huge. The best part about this Keratin Lash Lift and Semi-Permanent Mascara is that there is ZERO care needed for them. You can wash your eyes (just not within 12 hours of doing the treatment) and rub them however you want and nothing will happen to them. This was before I went to Pink Dot.. and it was a horrendously warm and humid day. Nothing happened to my lashes though! Next day I was off to Bali! This was me after taking a flight at 5am and arriving for breakfast at Sisterfields at 10am. I still look awake and decent, zero makeup except for Orbis sunscreen on face and lips! Fresh faced, as you can see! Finally this was taken yesterday (before I went to dye my hair) - it's been two weeks and my lashes are still fabulous! I couldn't recommend this treatment enough for how low-maintenance yet high-mileage it is. Anyway I mentioned that there's a buy one get one promo for the Keratin Lash Lift if you use my Advocado link (simply fill in your mobile number!). That means it's just S$39.50 for a Keratin Lash Lift session (get 2 sessions for yourself or share with a friend if you book both sessions together). What are you waiting for? Get the promo with my link and call to make your appointment now. Thanks to Beauty Recipe and Jessie for inviting me to try the treatments! Hi Alexis, your eyelashes turned out very nicely! May I know which beautician did it for you at Beauty Recipe?